Perhaps some gatekeepers are realizing that the challenging short story form proves a writer's chops and future longevity with more certainty than a debut novel. There's something subversively bullish about a debut short story collection that's first published by a small indie press mostly unknown to the larger reading and publishing world and then, when the writer goes on to prove her chops in various genres, is re-published by a larger publishing house. Same book (with just a few changes), same writer. Which only goes to show how unreliable and short-sighted the many tastemakers and gatekeepers of the publishing industry can be. 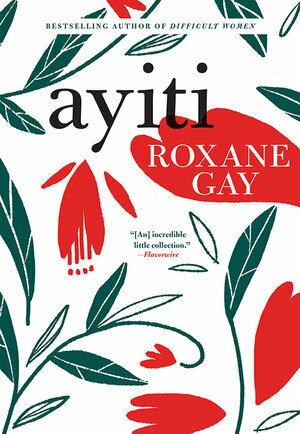 The collection is Roxane Gay's debut book-length work, Ayiti. Comprising of 15 short stories, including flash fiction and some essayistic pieces, it was released in 2011 by Artistically Declined Press and has been published afresh by Grove Atlantic this year with a couple of new stories. Since 2011, Gay has become a major name in the literary world with many articles and op-eds in leading venues, a novel, another short story collection, an essay collection, and a memoir. She teaches at Purdue University and miraculously finds time to provide on-point socio-cultural commentary on news and social media — the latter proved by her massive following on Twitter and Goodreads. All the stories and essays here share an earnest aim to dispel the many misconceptions and falsehoods about Haiti and her people. ("Ayiti" is how Haiti is sometimes pronounced.) As the second-most populous nation in the Caribbean region, it's also the only one in the world established as a result of a successful slave revolt. In these times, most of the images we see of Haiti are those of a country ravaged by wars, disasters, poverty, and more. Yet, we have begun to also know, thanks to writers like Gay and her contemporaries, a citizenry that continues to be resilient, hopeful, and creatively resourceful. Haitian literature draws on its own rich, centuries-old traditions as well as those of Western settlers. US diasporic writers like Roxane Gay and Edwidge Danticat have been exploring Haitian culture through their insightful writing for some time now. Haitians living both in Haiti and in the US populate these stories. Gay shows us their many colors and identity conflicts — whether caused by their struggles to assimilate into the US or attempts to reconcile with how they sense their belonging to Haiti. Some stories deal with social stigmas like body odor and accents. Some explore stereotypes like voodoo practices and dirt-eating. And some spotlight the love-hate relationship that Haitians have with their home country — whether they are trying to escape, or stay away, or return. Overall, that latter ambivalence of the characters works well to present a nuanced, ever-shifting, ever-evolving narrative of Haiti that we rarely encounter in mainstream media. My parents were born in Haiti, the first free black nation in the world. It is an island of contradictions. The sand is always warm. The water is so clear-blue bright that it is sometimes painful to behold. The art and music are rich, textured, revelatory, ecstatic. The sugarcane is raw and sweet. And yet. What most people think they know is this: Haiti is the poorest country in the Western Hemisphere. Her people eat mud cakes. There is no infrastructure — no sewer system, no reliable roads, erratic electricity. Women are not safe. Disease cannot be cured. Violence cannot be quelled. The land is eroding. The sky is falling. Freedom, it seems, has a price. We are defined by what we are not and what we do not have. The longer works, with their more traditional structures and character development, give us those singular moments of human experience that turn entire worlds upside down and shape the lives to come. Of these, 'Sweet on the Tongue', has a plot that's reminiscent of Gay's novel, An Untamed State. In this shorter form, the traumatic event is just as hard to turn away from because Gay has carefully layered the right selective details to gradually reveal it and its long-unraveling aftermath. Gay has tackled many of these complex themes and issues at greater length in other works since. But her skill at depicting emotions and images with precise, vivid, punchy prose is abundantly clear even in this early work. There's a good deal of violence and tragedy, but there's also poetry and beauty. She illustrates, again and again, how all of these can coexist to create both quiet, deadly devastation and sweeping, lyrical joy in a country that has seen much of it all throughout its history and continues to do so. If one wants to gripe about something, it would have to be the lack of sufficiently multi-dimensional views of the characters' lives through relevant historical, linguistic, and geo-political contexts in the longer stories. These things might have given readers more to reflect on. Still, a short story is about the art of the glimpse and not about full plot or character arcs and the many, varied glimpses Gay gives us of her Haitians and Haitian-Americans in this collection are unforgettable. That said, publishers would most likely call this first book "an uneven collection" because all the works included do not follow a traditional format. It's one of those weird neuroses of the literary world where a mediocre novel with boring bits, caricatures for characters, flimsy sub-plots, etc., will get published easily because there are "moments of brilliance" or the subject matter is "on trend". But a short story collection, where almost every story has probably undergone a rigorous review process with literary magazine editors — as is the case here — is held to a different standard. The usual argument is that, with unknown writers, readers are not quite as forgiving with short story collections as they are with those from established writers. This is both disingenuous and misleading because what it actually comes down to is an additional effort required to position and market debut short story collections. It's easier to sum up a debut novel in a couple sentences when asked what it's about. With multiple stories, even when they are connected by themes or place (as with Haiti here), publishing gatekeepers shy away because they cannot bank on an unknown author's name for an easy sell. And yet, 2017 and 2018 so far have been excellent years for short story collections, including debut ones. Perhaps some gatekeepers are realizing that the challenging short story form proves a writer's chops and future longevity with more certainty than a debut novel and are finally seeing it as a worthwhile early investment. Perhaps readers are also more willing to consider short story collections worth spending time and money on. Long may this trend continue.